Since coming into his own in the 1970s, Werner Herzog has created a formidable body of work with films that prove as epic and probing in documentary form as they do in the monumental fictions for which he's most known. Long passed around as samizdat on bootleg tapes, Herzog's early documentaries, now receiving a revival at New York's Film Forum, focus on a variety of subjects: the strange language of cattle auctioneers, a ski jumper who starts jumping too far to stay safe, an island abandoned in the face of imminent destruction by volcano (abandoned, of course, except for a handful of stragglers and Herzog himself). His method involves a certain amount of shaping and arranging behind the camera, but Herzog's stories tend to rise above questions of their provenance. A later documentary—the great Little Dieter Needs To Fly, which tells of the story of a Bavarian child who dreamt of flying since first seeing an airplane during WWII and later crashed into a sickly fate as a POW in Vietnam—serves as the basis of Herzog's forthcoming fictional feature Rescue Dawn, which stars Christian Bale. The A.V. Club: You prefer the term "non-fiction" to "documentary" to describe these films. How is the difference significant? 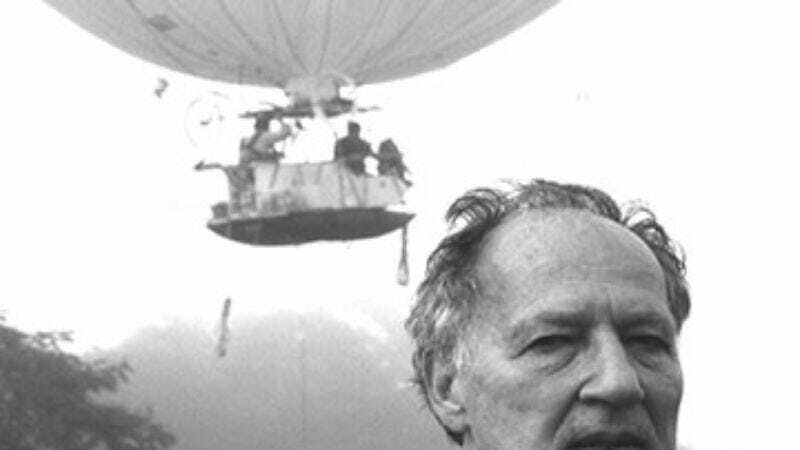 Werner Herzog: Even my non-fiction films are pretty much fiction, or at least close. But we shouldn't wrestle with categories. It's all "movies" for me. I never have searched for a subject. They always just come along. They never come by way of decision-making. They just haunt me. I can't get rid of them. I did not invite them. AVC: Is part of your impulse to create a narrative for your subjects to better understand their own stories? WH: That makes it sound like there's lots of planning and structuring, but I'm not so into that. I work very fast. When I did Grizzly Man, the film was edited in nine days, [during which] I also wrote and recorded the voice-over text. So there's not much structuring—I just plow through it and do the films the way they should be. AVC: How do you choose which form to employ? Why did you choose to revisit the story of Little Dieter as fiction in your new film? WH: That was strange because it was the other way around. There was always a feature-film idea first. The feature took more time to get financing together, the organization in place, casting and all these things. But retroactively, the feature film was always first. If you look at it like an accountant, you can say the documentary came first. But the spirit of it is different. AVC: As a storyteller, what do you gain from the documentary form? WH: It depends on the kind of story. Some lean more toward a fictional approach; some lean more toward a documentary approach. It's very much inherent in a story. There's not decision-making in my work. I just know deep inside this has to be made in this or that way, and I do it. AVC: With the documentary style so prevalent these days, how has your experience making them changed? WH: There's a different sort of readiness among audiences to watch documentaries. Some of them have made it to theater releases, some quite successfully. I think that's a sign that audiences understand instinctively a cultural phenomenon—that is, our sense of reality is very massively challenged. We have virtual reality. We have video games. We have WrestleMania, where everything is somehow fake and orchestrated. We have Photoshop, and digital effects in movies. There's a huge onslaught against what constitutes reality. When you watch reality TV that pretends to be reality, of course it's a highly stylized figment of our imagination. Because of that, we as filmmakers need to redefine our position on reality. AVC: Does the prevalence of reality programming make you more wary to stylize and shape your own documentaries? WH: No, it's quite the contrary. You see, what cinema verite tried to do was to present just the accountant's truth. They were too fact-oriented. I have always postulated that we have to find a new way to deal with reality. It's not so much facts that interest me, but a deeper truth in them—an ecstasy of truth, an ecstatic truth that illuminates us. That's what I've been after. And in order to find it, you have to be imaginative. You have to invent. You have to stylize. There's absolutely no danger in that. The danger is to stupidly believe that depicting facts gives us much insight. If facts were the only thing that counted, the telephone directory would be the book of books.